With the fall semester beginning Tuesday, August 16, Cowley College students began moving into the dorms on Saturday during the school’s annual Dorm Storm event held from 9 a.m. to 4:30 p.m.
A cookout outside the McAtee Dining Center followed the event, while Cowley students also had an opportunity to swim for free at Paris Park Pool. Quentin Dickey, a recent graduate of Newton High School, was among those moving into the dorms on Saturday. 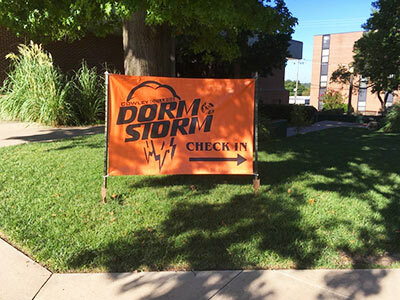 According to Landon West, director of housing, the dorms are near capacity. Dickey plans to major in computer science and looks forward to being active on campus. “I hope to have a fun college experience and get a good education which will allow me to transfer to obtain my four-year degree,” Dickey said. On Tuesday, August 16, famed hypnotist Joshua Seth will bring his unique brand of hypnotism to Cowley College for a 7 p.m. performance in the Robert Brown Theatre. A Back to School Dance will be held Wednesday, August 17 from 8:30-11:30 p.m. in the Earle N. Wright Community Room. Make a customized license plate on Thursday, August 18 from 6-10 p.m. in the Jungle. Free Late Cowley College Movie Night at Cowley Cinema 8 will take place at midnight on Friday, August 19. Following the movie Cowley students can head to Ike’s Donut Shop for free donuts.